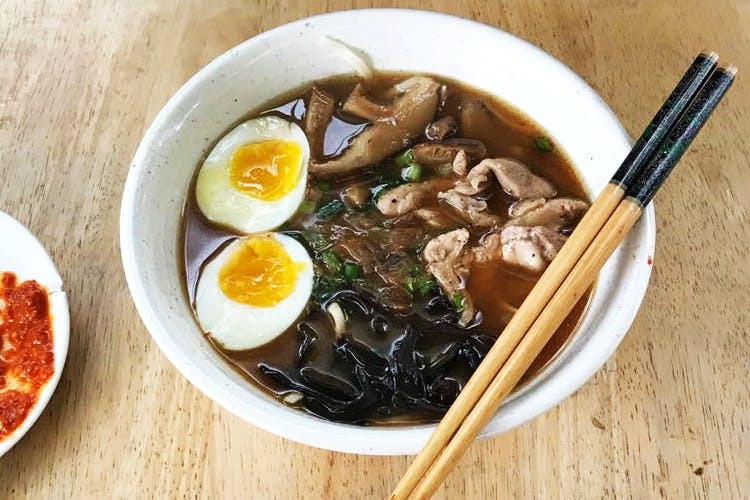 A no-frills ramen menu is what you get at Indiranagar’s new ramen place, Oishii Ramen. Plus, a cute space that makes slurping on noodles date-worthy. Finding Oishii Ramen might be a little tough even though it’s listed on Google Maps. That’s because there’s no branding done yet and it’s located in the same space as Sunny Side Bistro. In fact, Oishii Ramen shares space with Sunny Side, which is set to re-open in a couple of weeks. Probably why the space looks more like a cute bistro with plenty of planters and fairy lights and less of a ramen bar. The only connection to ramen and Japan are the few red and yellow flags hanging from a potted tree. But hey, the space works for us especially those who like ramen and conversation. The ramen menu at Oishii Ramen might not be for fancy purists and ramen lovers, but hey, it does the job with its three kinds of chicken, two vegetarian, and one seafood ramen. Yup, just six ramen for you use your chopsticks to slurp up the noodles. Chicken Gyoza, Spinach Sesame, and Chicken Wings are your starters. Coming to the ramen, Spicy Chashu Ramen and regular Chashu Ramen are what we tried on two separate occasions. The first time around, since they had just opened when we visited, we got our Chashu served with udon noodles instead of the thin ramen noodles. The broth was spicy and flavourful, and there was plenty of chicken slices to devour. The next time, we picked the regular Chashu ramen. Disappointed that it wasn’t pork, we picked the chicken option with a bit of hesitation. What’s a Chashu without pork really, but with such spot-on broth, and generous helpings of Japanese black fungus, we were not sad for long. The chicken with a slightly sweet tinge to it, soaked up the broth though we did miss the saltiness of the pork. The sheet of seaweed, nori, made it that much for wonderful. There’s also Laksha Ramen which takes a Malaysian influence. While waiting for your ramen to arrive, and it does take long, as they are new at this, order up some Gyoza Chicken. The casing was thicker than we had had in Japan, and it did resemble a momo more than a gyoza, but we wolfed it down no less. We found the soy sauce a bit bland, but luckily the piquant spicy sauce saved the day. There is also chicken wings and spinach sesame on the menu, the latter of which wasn’t available the day we went. We can’t wait for pork to be on the menu, as ramen without pork isn’t very authentic. Also, service needs to be a bit quicker. We will just brush it off as teethings troubles, for now.